Lewis Mearns was the hat trick hero for Ballymena United Youth Academy under 13’s on Saturday in a 4-1 win at Carrick Rangers. The under 15’s made the long trip to Strabane and came away with another victory while the under 12s drew with an impressive Dungannon in a Friday night thriller on the Showgrounds 3g. The under 11’s had no fixture at the weekend while the under 14’s lost out narrowly to a top Limavady side away in the league cup. There were another two wins for the flying under 16’s and u17’s at the senior club in another impressive weekend for the senior youth teams. The Academy under 15’s are in action again on Tuesday evening with a league fixture in Cookstown against Loughgall. BUYA 4, Dungannon United 4: Early pressure from the Tyrone side led to their opener but United replied immediately, a clinical finish from Ross McCausland after good work by the impressive Kyle Neill. United edged ahead with another driving run from Neill before rifling home but Dungannon equalised inside two minutes as the Skies failed to consolidate. The visitors went ahead once more, a cool finish from the Dungannon striker before the half time break. The second period was again helter skelter stuff as United equalised from Neill once more. Dungannon did edge ahead once more before Blake Douglas whipped in a dangerous free kick which went in at the back post. There was still time for an outstanding save from United keeper Lewis Clewer, and a penalty miss for the visitors before the referee blew for full time. MOM - Leon Coulter, Kyle Neill. 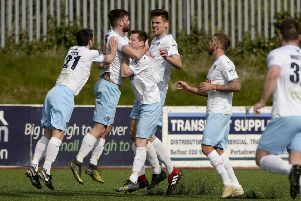 Carrick Rangers 1, BUYA 4: Ballymena exacted revenge on the only side to defeat them this season. It took Ballymena 20 minutes to make the breakthrough when Ross McCausland’s run set up Lewis Mearns who made no mistake from just inside the box. The second half followed the same path and again good work this time between Sean McAllister, Bradley McCartney and Ross McCausland led to the ball arriving to Mearns who this time flicked it past the keeper to double the score. Bobby Rainey and Max Davidson combined in midfield and this released Lewis Mearns who got in front of the defender and finished in style. Oliver Hampshire netted the fourth with a good finish from a corner after Carrick had got one back as United wrapped up promotion. Limavady Youth 3, BUYA 1: Ballymena moved the ball well in the first half and on 15 minutes they took the lead when Robbie McGaughey crossed for Sam Robinson to head the lads ahead but Limavady’s direct style of play saw them score three goals in the second half. Sion Swifts 1, BUYA 3: Quick thinking from a short corner led to Joshua Galloway picking up the ball at the edge of the penalty area and he made no mistake with an arrow like finish to send the Skies ahead. United made it two after Padraig Slane’s cross from the left was met by Danny Louw with a quality first touch and then a lovely placed finish from the Clough boy. Slane again was the eye catcher racing past his marker after a through ball before hammering home from the angle before Sion scored with a tidy finish.